I susbscribe to the analysis that "stairs are a design error - a failure of imagination." Los gobeirnos de las naciones de America Central han prodizido un curso ejectutivo sobre turismo para todos. Continue reading Turismo que Incluye a Todos. More than one in ten, that is, at least 50m citizens throughout the EU, must deal with a disability and are confronted daily with physical barriers. And, as populations are increasingly ageing and disabilities are often acquired with age, their number is set to increase. Although EU legislation has been in place since 2000 to implement the principle of equal treatment in employment, disabled people still remain among the most disadvantaged social groups throughout Europe. Indeed, 45% of Europeans recently surveyed think that discrimination amongst disabled people is particularly rife. "Wisconsin: Smell the Dairy Air"
The sensory paradox of traveling through a city of 20 million while subtle undertones of feedlot waft through the air is confusing to the American palate. Oddly, days and days of monsoon rain eliminated any trace of industrial or automobile pollution. The travel industry sells experiences. 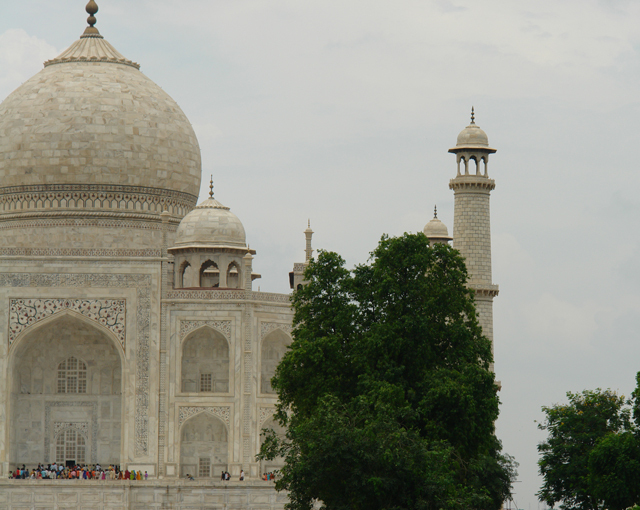 India's Incredible India campaign has been remarkably successful at increasing tourism. It has "captured the imagination" with an unspoken command. "Imagine India. Imagine yourself in India." Imagine me, India. Imagine us in India. Handicapping barriers are at their root a failure of imagination. Universal Design is meant to tickle the imagination into full awareness; into enlightenment. Santos also took advantage of the travel opportunities organized by the SVILC, going to Disney World, Las Vegas, and Alaska. She kicked off her adventures with a trip to Hawaii, which was a big step because it was her first time flying. “Six months after that, she went on her own on a trip to the Philippines to visit her parents,” SVILC’s Director of Development Shobha Srinivasan says. “She hadn’t been to the Philippines since she was a teenager. That’s what this center does for people. It gives them a ‘we can do it’ attitude.”. Continue reading Inclusive Travel and the Silicon Valley Independent Living Center (SVILC). New Delhi is famously congested –even with every square inch of road, meridian, and shoulder put to full use as a travel lane. Starting about an hour late due to rush hout traffic the first workshop in the Inclusive Travel series filled the auditorium at the Surya Crowne Plaza. It was about as full at the end of the day (sometime after 6 pm) as at the start – a good indicator of a match between message, audience, and delivery. Continue reading Inclusive Tourism Workshop Series - India. As a travel agent colleague here in New Delhi commented, "India is not a destination for beginners." 1- Los pasajeros con deficiencias de movilidad en especial los que utilizan sillas de ruedas, deberían tener fácil acceso a servicios de transporte de ida y vuelta hacia y desde todas las terminales de los c/ Los prestadores de servicios deben contar con personal capacitado en la atención de PMR. medios de transporte. 2- Siempre que sea posible, las terminales deberían estar situadas a un mismo nivel o equipadas con rampas donde exista un cambio de altura. 3- Cuando sea necesario, deberían preverse rampas especiales o ascensores no utilizados para carga y otros fines, con destino a las personas con deficiencias de movilidad y a las que utilizan sillas de ruedas. 4- Los cruces de las vías de acceso deberían estar provistos de se?ales especiales y semáforos para las personas con deficiencias visuales o auditivas para que puedan atravesarlas con seguridad. 5- El acceso a los medios de transporte debería ser lo más sencillo posible y disponer de asistencia cuando sea requerida. Continue reading Trang web cá cược trực tuyếnPara un turismo accesible a los minusválidos en los a?os 90 (Spanish). Continue reading Ketna L Mehta: "Designing a Disabled Friendly Inclusive World Class City". A new research report commissioned by the Government shows that while progress is being made, disabled people in Britain are still more likely than non-disabled people to experience disadvantage in a variety of areas. Experiences and Expectations of Disabled People, the first comprehensive study of disability issues in six years, looked at key policy areas including employment, education, transport, health and discrimination across Great Britain in 2007. The research, which was commissioned by the Office for Disability Issues (ODI), provides a unique snapshot of the lives of nearly 2,000 disabled people. The study was ground-breaking in that it actively involved disabled people throughout the research process. The Anand Vihar Railway Station in Delhi received an accessibility assessment during construction. The responsible team was a collaboration between Samarthya and Handicap International. The May 2007 study is available here. A follow-up is underway. To Our Students in India: "Extra Credit Homework"
One of the joys of opening up the real world of people with disabilities to others is sharing the moment when a light goes on and the seemingly vast distance between disabled and non-disabled disappears. Sometimes we do that with a role-playing exercise, a discussion, an article or just in casual conversation. For those who will attend the New Delhi, Mumbai, Kochi, or Chennai workshops sponsored by ASTA - India I offer the following online videos to trigger that moment. Welcome to the art and images of disability culture from around the world. Continue reading To Our Students in India: "Extra Credit Homework". Samarthyam, National Centre for Accessible Environments New Delhi (India) has issued a statement on the need for Inclusive Tourism in India. Continue reading Samarthyam on Inclusve Tourism. The Incredible India campaign has taken off for the country making the tourism sector witness huge buoyancy in recent times. The marketing strategy has helped India achieve unprecedented growth in terms of both volume and value. Foreign tourists arrivals to the country have grown at a cumulative annual growth rate of 15.86 percent touching almost 4.2 million in 2007, an increase of 12.4 percent compared to 2006. Foreign exchange earnings from tourism registered a cumulative annual growth rate of 30.97 percent in the same period with figures for 2007 closing at $ 11.956 billion – an impressive spike of 33.8 percent over 2006. Domestic tourism continues to surge, showing more than encouraging trends with tourist visits over 461 million in 2006. By 2010, with the Commonwealth Games to be held in New Delhi, India expects to hosts 10 M tourists. Everything seems perfect. The problem: lack of rooms. But all rooms are not created equal. Some discriminate by design. Will these rooms be accessible by national standards? Not if they are 1 and 2 star venues. And maybe not even if they are 3, 4, or 5 star class unless enforcement drastically improves. One organization in India has distinguished itself on the national and international stage for innovation and expertise in Inclusive Tourism - Samarthya. It follows the path of "Promotion of a Barrier Free, Rights-Based Inclusive Society." At the center of this remarkable organization are Ms. Anjlee Agarwal and Mr. Sanjeev Sachdeva. They have been trained in the Promotion of Accessible Tourism at Bali (Indonesia), 2000; Non-Handicapping Environment for Disabled People by United Nations Economic and Social Commission for Asia and the Pacific (UNESCAP), 2002 & Asia Pacific Development Centre on Disability (APCD), Bangkok (Thailand) 2004. They have in turn taken this training and put it to continuous use for the benefit of their nation and the region. Continue reading Samarthya: A World-Class Example of Inclusive Tourism Promotion. A Secretaria de Turismo da Argentina deu um passo importante ao definir as diretrizes para a acessibilidade nos alojamentos turísticos do país. A consolida? ?o dos esfor?os para convocar os empresários do setor hoteleiro argentino a aderirem o processo de implementa? ?o é a reta final para viabilizar as normas que entram em vigor em setembro próximo. O evento, que teve lugar em San Martín de Los Andes, em meados deste mês, teve como objetivo familiarizar o setor de hospedagem com a quest?o da acessibilidade e do conjunto de práticas para viabilizar a sua aplica??o. Em linhas gerais as autoridades do turismo argentino visam otimizar a presta? ?o de servi?os, assegurar a satisfa? ?o dos usuários e promover a inclus?o sem discrimina??o. Continue reading Turismo Inclusivo na Argentina e Sergipe (Portuguese). Free2Wheel - India Promotoes Its Accesssibility Travel 2.0 Style! Sometimes it is some hard to not tell you all about excitng new developments for travelers with disabilities when they are still in "Top Secret" phase. Free2Wheel, a first of its kind information service in India, endeavours to encourage people using wheelchairs in getting out and about. This web site has over 1600 listings of places of interest in Delhi and NCR like budget and star hotels, shopping malls, historical monuments, restaurants/bars/pubs/nightclubs, cafe, currency exchange counters, and tourist information centres etc. Each listing is accompanied with an accessibility overview of the site. This portal provides an interactive zone, and we invite you publish your travel-logs, upload pics of your latest escapades, rate and comment on the enlisted places so that most people can benefit from your experiences. Most importantly, we will be grateful for any feedback that can assist us in improving this website and the soon to be released travel guide. Free Your Wheels & Enjoy Delhi !! Aventurero e pionero de turismo adaptado em Brasil, Dadá Moreira de Aventura Especial, tem ataxia. Aqui tem varias entrevistas com ele. A draft anti-discrimination directive from the European Commission has been criticised by a major disability lobby group for failing to cover technology accessibility standards. The commission’s proposal, ‘Non-discrimination and equal opportunities: a renewed commitment’, deals with discrimination against people on the basis of disability, race, religion, gender or sexual orientation and covers non-employment areas such as education, social security and health care (see http://fastlink.headstar.com/eur8). In addition the document “leaves room for interpretation and will create legal uncertainties”, Vardakastanis said (see http://fastlink.headstar.com/edf2). The EDF was created in 1996 to give a voice in the European Union to Europe’s 50 million disabled people (http://www.edf-feph.org). Continue reading Disability Body Blasts EU Anti-Discrimination Draft. Over the past ten years the European Blind Union has been working to improve travel by air for blind and partially sighted, deaf blind and blind people with additional disabilities. As a result of our work, we are pleased to inform you that from 26 July 2008, the new Air Regulations come into operation at all airports throughout Europe. To ensure these regulations work, we need your help in monitoring them at your local airport, to find out if they have in place, their staff with disability awareness training. Continue reading European Blind Union on Air Travel in the EU. Steve Kuusisto will speak Thursday July 24 at Diversity Focus' Brown Bag Lunch Series, from noon to 1 p.m. at the Iowa City Chamber of Commerce, 325 E. Washington St. No. 100, Iowa City, Iowa. The event is free and open to the public. Kuusisto will present "Universal Design and the Town Square: Why Disability Affects Everyone." He will discuss disability history and the development of new models of accessibility. Kuusisto is an author and holds a dual appointment at the University of Iowa, where he teaches courses in creative nonfiction and serves as a public humanities scholar in the University of Iowa College of Medicine. He speaks widely on diversity, disability, education and public policy. For more information, call 363-3707. Una experta en protocolo y etiqueta escribió sobre el tema de personas con discapacidad y las normas de etiqueta para tener en cuentaen El Tiempo diario de Colombia. Continue reading Comportamiento en sociedad: Personas con discapacidad (Spanish). Intergenerational Girls-Only Travel - Where's the Accessibility? Annie Roegner, her two sisters and a friend recently took Roegner's mother, Evelyn Roegner, on a 15-day cruise of Hawaii. The trip was a present for Evelyn Roegner's 80th birthday. The trip was a success, although the group had trouble finding accessible shore trips for Evelyn, who uses a walker, Annie Roegner said. That's an issue that anyone traveling with an older family member should investigate before a trip, she said. "The ship is accessible, but who wants to stay on the ship all that time?" she said. "The excursions she could go on were very limited." Yesterday's Day on the Beach in Santa Cruz California was another demonstration of community support for making the beach town a destination of choice for people with disabilities. A iniciativa é das secretarias municipais da Pessoa com deficiência e Especial de Turismo. O objetivo é beneficiar profissionais dos setores público e privado que trabalham no atendimento a turistas. Conforme comunicado no Diário Oficial desta sexta-feira, as aulas-gratuitas, com total de 50 horas, ser?o ministradas às segundas-feiras, entre 9h e 12h, no Ciad - Centro Integrado de Ate? ?o à Pessoa com Deficiência - Mestre Candeira, que fica na Avenida Presidente Vargas, 1.997. Overall, remodeling activity is falling at an annual rate of 4.8% in 2008, according to the Joint Center for Housing Studies at Harvard University. But the fastest-growing segment of the remodeling industry is overhauling homes for the 50-plus crowd. Making your home a place where you can grow old comfortably doesn't mean littering it with sterile-looking devices reminiscent of nursing homes. The trend is to "universal design," which calls for safe, easy-to-use appliances that blend in with their environment. Doorknobs are replaced with handles (easier to open), lights made brighter (for aging eyes), door frames widened (for wheelchair access), and grab bars installed in the shower. "It's no one thing," says George Cundy, architect with the firm Cundy, Santine & Associates in Shoreview, Minn. "It's a combination of things that makes the difference so you can stay there." Continue reading Remodelling, Aging-in-Place, and Unversal Design. Personas con discapacidad actuarán como voluntarios durante los Juegos Olimpicos y Paralimpicos de Beijing 2008. Puestos como centros de llamadas para atención a usuarios y kioskos de información serán ocupados por voluntarios con discapacidad seleccionados en el proceso de formación del cuerpo de voluntarios integrado por 87 mil personas, la mayor de todos de 87 a?os, que representan la diversidad de culturas en la cumbre del alto rendimiento deportivo mundial. Concursaron 600 mil aspirantes al cuerpo de voluntariado, muchos de ellos con discapacidad. Although originally nudged along by litigation Avis Rent A Car continues to show commitment to the disability community as travelers with further improvements in service announced yesteerday. Continue reading Advances at Avis. Está disponível para download em PDF o Manual de Convivência, um guia prático de como se relacionar com as pessoas com deficiência. El coordinador de Investigación y Desarrollo de la Oficina de Accesibilidad de Bélgica, Steven Vos, afirmó durante su intervención en el 'II Congreso de Turismo para Todos ENAT' que, teniendo en cuenta a las personas con discapacidad, a los mayores, a las mujeres embarazadas, a las familias con ni?os peque?os y a quienes tienen otras limitaciones, 'alrededor del 35% de todos los europeos pueden beneficiarse de las mejoras de la accesibilidad en el turismo', como las instalaciones y los servicios accesibles. "No obstante, sólo un porcentaje muy peque?o del mercado se ocupa de las necesidades en materia de turismo accesible", agregó Vos. Este experto belga comentó que hay una gran cantidad de hoteles, servicios de transporte y lugares turísticos que "no son físicamente accesibles" para muchas personas con discapacidad y personas mayores. "Falta información precisa y accesible, los empleados no están capacitados para proporcionar servicios adaptados a las personas con discapacidad, y el personal de los servicios de turismo a menudo carece de formación sobre los medios para satisfacer las necesidades de accesibilidad de los turistas con discapacidad", agregó Vos. Continue reading Hacer accesible el turismo beneficiaría al 35% de los ciudadanos europeos (Spanish). Michael Wells, a manager, told Watchdog that the hotel has 189 spaces total, five of which are for disabled motorists, including the one covered up. He said the hotel was only required to have four. He declined additional comment. In fact, the hotel is required to have 6 spots available at all times. Continue reading Marriott Courtyard in Columbia, SC. Route 66 once had a mythical attraction to Americans as the ultimate "road Trip." 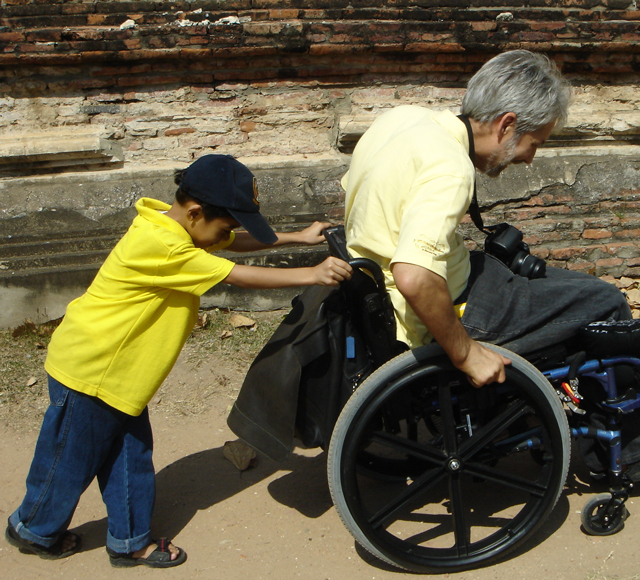 Jason Angel relives the magic as a traveler with a disability. Continue reading Route 66 -- and Accessibility -- the Jason Angel Story. 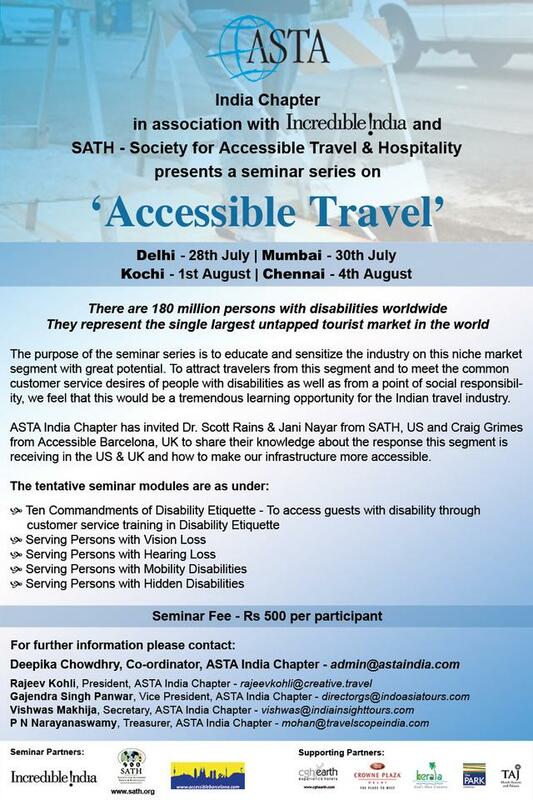 On July 28 I will begin a four city workshop tour for travel professionals in India with Jani Nayar of SATH and Craig Grimes of Accessible Everything. The first workshop will be in New Delhi, followed by Mumbai, Kochi, and finally Chennai. As Internet connectivity permits I will post travelogue entries along this tour sponsored by ASTA India. Continue reading Promoting Inclusive Tourism in India. NEW DELHI—Keith Lotman went to New Delhi on a two-week business trip. But a quick day of sightseeing in India's capital city left him enthralled and ready to see more of the country. "I have about a hundred different places that I'd like to visit," said Lotman, 31, a business executive from Philadelphia, as he checked out the world's largest Bahai temple in New Delhi. "A hundred different kinds of experiences." He added: "It's very different from any place I've traveled to before. Culturally very different. I'd definitely like to go to Agra to see the Taj Mahal next...."
New tourists like Lotman have helped feed a boom in travel to India, and the country is now nearly as popular a destination for Americans as Spain. Travel to India from the United States increased 10 percent between 2006 and 2007, on top of an 8 percent rise the year before. More Americans visited India last year than went to Ireland or Thailand, according to the most recent data from U.S. Department of Commerce. The upsurge in Americans visiting India is part of broader boom in India's tourism industry. In 2007, some 5 million travelers headed to India, nearly double from 2000, according to the Tourism Ministry. Visitors from the U.S. accounted for 15.7 percent of the total. These include a large number of business travelers, wealthy retirees out to explore India from the comfortable confines of an air-conditioned luxury bus or train, and people of Indian origin eager to see their parents'—or grandparents'—homeland. Even better, watch Rolling Rains for a travelogue as we go. Continue reading India Rising in Popularity with American Tourists. I" have four wheel on my wheelchair but I seem to spend most of my tme on just two, popping wheelies overt the cracks and crevices in the street." S?o passeios a pé, no bairro de Alfama, em que os participantes têm os olhos vendados e s?o conduzidos por um guia invisual da ACAPO que partilha as suas referências sensoriais. Est?o também presentes um guia Lisbon Walker, que faz a contextualiza? ?o histórica do percurso, e 4 elementos da Associa? ?o do Património e da Popula? ?o de Alfama (APPA), que ajudam os participantes a percorrer o espa?o. - proporcionar uma experiência sensorial, que visa a constru? ?o de um novo conhecimento do espa?o através do estímulo dos sentidos do cheiro, tacto, gosto e audi? ?o pela ausência da vis?o. - sensibilizar para o universo invisual, n?o num sentido incapacitante, mas num sentido positivo e estimulante, em que o próprio invisual nos convida a entrar no seu mundo de códigos e referências. The National Park Service has developed and made available a web site to aid visitors with disabilities and special needs to find accessible trails, programs, activities, and other features at national park units nationwide. It is hoped that we can assist visitors and their families and friends in travel planning to the NPS site of their choice. 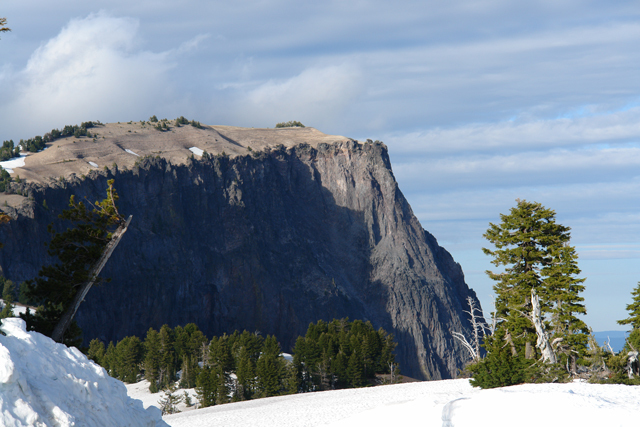 Visit the “National Parks: Accessible to Everyone” website at http://www.nps.gov/pub_aff/access/index.htm to learn about what opportunities are available in parks for visitors with disabilities and special needs. For families of children with disabilities going away for a summer trip is easier said then done. There may or may not always be traveling music involved, but there is hard planning and thorough preparation. Fortunately, families engaged in travel planning are not doing so in an information vacuum. Thanks to pioneers such as this month’s interviewee Dr. Scott Rains, inclusive tourism is a field of interest that is fast emerging from the shadows into the daylight of the information age. As defined by Dr. Rains, who invented the term, inclusive tourism is “the comprehensive application of Universal Design by the travel and hospitality industry at all stages of product lifecycle.” A related term, inclusive destination development, “similarly starts with Universal Design in looking at the creation, management and marketing of tourism destinations, Dr. Rains notes. Continue reading From the Family Center on Technology and Disability. Will You Be Traveling to Ohio? The following video was produced by Day al-Mohammed to support discussion of disability issues by the US presidential candidates. Are the Olympics Bad for Tourism? ETurboNews reports on a finding that hosting the Olympics seems to damage future tourism statistics. This is a fact worth pondering within our community since the construction of accessible infrastructure for the Olympics and Paralympics is one of the arguments we have used to support the games as contributors to Inclusive Destination Development. Perhaps there would be less of a falloff in tourism if a city's Olympic Planning Committee was truly committed to Universal Design (Inclusive Destination Development) and began a campaign presenting their post-Olympic messaging before and during the games. The message would highlight accessible "easy travel" by people of all abilities. Tom Jenkins, executive director of the ETOA [European Tour Operators Association] , argued that the tourism benefit of staging the Olympics was something of a myth, saying that the effect of staging a large sports event is to scare regular visitors away from host cities, not just during the events themselves but in the months leading up to them. “The principal problem is the impression that everything will be overcrowded and overpriced and this blights a region,” Mr Jenkins said. As visitors become deterred, the effect on subsequent demand becomes detrimental, losing the momentum of sales and suppressing marketing, he added. Continue reading Are the Olympics Bad for Tourism?. In an interview with TH Online she makes the inclusion argument using the Open Doors Organization survey results on the travel behavior of people with disabilities - another sign that Inclusive Tourism is simply becoming the 'common sense' approach in heartland America. Besides needing to abide by the law [ADA], accessibility is good business, Wilberding said. A travel industry survey shows that four out of 10 travelers are either disabled or traveling with a disabled companion. And according to the U.S. Census Bureau, more than seven out of every 10 Americans will acquire some sort of disability by the time they reach the age of 75. "Most don't realize the business they are losing because they're not accessible," Wilberding said. Continue reading Dubuque Aims to be 'Proudly Accessible'. Tourism has eclipsed traditional industries and livelihood options in many parts of the world and has emerged as the single most important industry in several countries. However, studies that seek to understand its impacts on economy, environment, and culture are constrained by methodological and theoretical limitations. One of the reasons for the ambiguities and inadequacies in the area of tourism research has been its inability to properly appreciate the importance of the ethical dimensions of human development. Continue reading Transforming / Re-Forming Tourism. 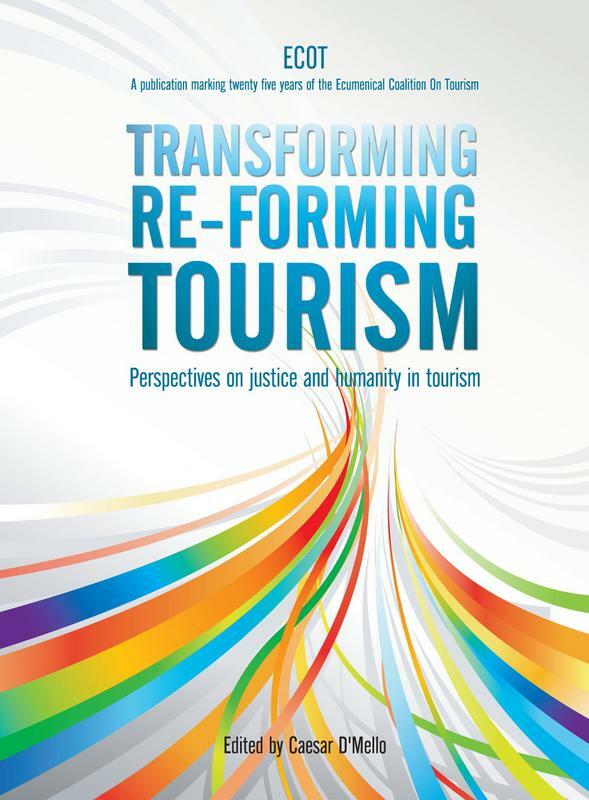 Perspectives on Justice and Humanity in Tourism’: Perspectives from 25 years of civil society. A new stock photo agency? Disabilityphoto.com, is aggressively seeking photos and illustrations of? by? and for the disability community. The site’s goal is to offer a unique place for royalty–free and rights–managed photography and illustrations. and many others. However, Creative Director Jennifer Ruf wants to get the word out that there’s no limit to DisabilityPhoto’s quest for talent. huge amount of disability artwork will be available at a buyer’s fingertips. We’re calling on all artists? from amateurs to professionals? to contact us. has a great layout to make it easy to find exactly what you’re looking for. “With the goal of stocking the site with thousands of photos and art, Disabilityphoto.com promises to be the premier source for anyone seeking disability–related images. At the 4th IIPT African Conference, May 20th – 25th 2007, Kampala, Uganda, a course on Peace through Tourism was launched, discussed and enthusiastically received by the international community. 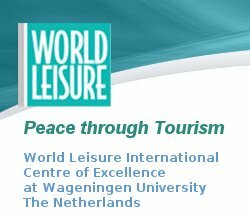 WICE – World Leisure International Centre of Excellence at Wageningen University, The Netherlands – developed this course; course director is Drs Jan te Kloeze. The course is an initiative aiming to consolidate the concept of Peace through Tourism. It is open to external participants, members of institutions interested in the subject, and tourism and peace policy makers. 4. Tourism and community development: tourism as an agent for poverty reduction. Continue reading Peace through Tourism Course Launched. Wireless RERC reports on proposed legislation affecting accessibility of communications and video technology in Technology and Disability Policy Highlights 8.06. Continue reading US: The Twenty-First Century Communications and Video Accessibility Act of 2008 [H.R. 6320]. Ever since I started working in inclusive tourism for people with disabilities I have always wanted to provide tours to deaf people in sign language. This is relatively easy if the tours that you are providing are to people from the country where the tours are based as the language is the same. The problems begin to arise when you are covering incoming tourism at the destination and the deaf people that want the tours are from various different countries. The problem being that the sign language in every country around the world is different, and even within the same country, there are wide regional dialects. There is probably really only one real way around this issue for deaf people, bring your own translator from home. However, this solution is very expensive, the problem of deaf people isn’t seen as a disability by many, it’s a communication issue, they use a different language, one which isn’t spoken but is signed. So where is the compromise? One solution that I have thought about whilst being in Nicaragua is to supply tours in American Sign Language (ASL) as the Americans are a stones throw from Nicaragua and probably the most likely to use the service. But who exactly do you teach ASL to in order to be able to give the tours? Your average tour guide is going to struggle for years to learn ASL to a good enough standard, so what’s the alternative? In Nicaragua there are many unemployed or poorly paid deaf people that use Nicaraguan Sign Language (ISN), which is different to ASL, but close enough so that with basic training they would be able to use ASL easily. This is the theory anyway! Therefore, thanks to the very generous funding of Mr. Jeremy Rowe a client and friend of AccessibleBarcelona, I am very proud to announce that on Monday 7th July the “First ASL - ISN Deaf Guide Training Course” begins here in Matagalpa, Nicaragua. I’ve been organising the course for the last couple of months with Seek Geo and Green Tours, Matagalpa. The end result is that Geo, and his hearing partner Jes, are flying down from the USA to help teach a total of 6 deaf people from Matagalpa, San Ramón and Jinotega basic ASL. We also have a local hearing translator attending the course to learn ASL with us and help out with ISN where required and Norlan Alberquerque of Green Tours has been helping us set up some basic routes to practise in Matagalpa. Continue reading Deaf Tour Guides for Deaf People? - by Craig Grimes. Julie has teamed up with Bob Davis of the GEOS Travel Safety Group www.geosalliance.com. GEOS provides integrated security, safety and resilient communications services for corporations as well as domestic and international travelers. With former police, military, and government security professionals in-house and having extensive knowledge of search and rescue (SAR) practice GEOS partnered with the manufacturers of the SPOT Satellite Messenger to provide a new type of personal safety device. I have been field testing it. Continue reading Usability Review: The SPOT Personal Safety Device. A adapta? ?o das cal?adas, ruas, bares, hotéis, pontos turísticos, entre outros espa?os, foi o principal tema debatido, esta semana, durante o I Seminário de Acessibilidade no Turismo do Distrito Federal, promovido pela BrasíliaTur com a finalidade de transformar Brasília na capital brasileira da acessibilidade. De acordo com a representante da Coordenadoria Nacional para a Integra? ?o da Pessoa Portadora de Deficiência (Corde), Isabel Maior, o fato de a cidade ser tombada é uma grande barreira que dificulta a realiza? ?o dessas adapta??es. “Brasília é uma cidade cheia de meios-fios e cal?adas. Isso dificulta a nossa circula? ?o do deficientes, que n?o consegue sair do carro e circular pela cidade. Até cidades medievais que também s?o tombadas pelo patrim?nio fizeram essas adapta? ?es, já Brasília n?o, pois sempre esbarra neste problema” diz Isabel Maior. Continue reading O direito de ir e vir de todos (Portuguese). Belotur lan?ou nesta semana um guia turístico de Belo Horizonte em Braille. é a primeira cidade do Brasil a ter essa iniciativa. Ele vem sendo preparado há sete meses e custou R$ 11.800,00, um valor considerado muito baixo pelo órg?o de turismo. Apesar de ter recebido o nome de guia de turismo, a inten? ?o principal do material n?o é atrair visitantes cegos. "O importante para nós é que os nossos deficientes visuais conhe?am a cidade. é mais um processo de inclus?o social do que de turismo propriamente dito", diz Fernando Lana, presidente da Belotur. Continue reading Turismo Domestico para cegos em Belo Horizonte (Portuguese). Continue reading IIDI Tours - DO NOT PUBLISH. I want to share my story to you. My life was indeed a struggle for me since I was a kid. I was not born deaf. That’s why I was raised in the hearing world, learned and adopted their culture. I consider myself a normal person. One day, I was 2 years old; an unexpected accident happened that changed my life forever. I accidentally fell from the stairs and the hard impact damaged my hearing. Since then, I didn’t notice it. I just continue my life. But, my parents discovered that I’m beginning to hear a little. For example they are calling me but I’m ignoring them. When they bought me to the EENT clinic that was the time they realize that I have a hearing impairment. Continue reading Raphael Torralba: My Story. Air Access Code: Are You Ready? ABTA is working with the Department for Transport on a revised voluntary Air Access Code, which is expected to be published this month. The code will outline steps agents, operators and airlines can take to help make their services more accessible to disabled passengers. Continue reading Air Access Code: Are You Ready?. In humanitarian emergency situations, persons with disabilities are amongst the most vulnerable groups of society and tend to be disproportionately affected by the impacts of disasters. At the same time, they often remain ‘invisible’, even though their number statically makes up approximately ten percent of any population. 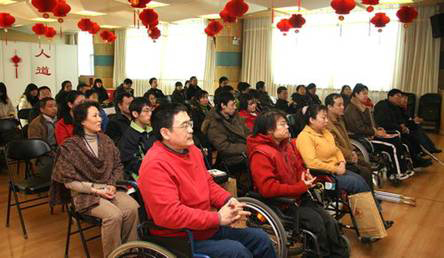 Persons with disabilities, be they of physical, sensory, intellectual or psychological nature, are most often not included in the various stages of disaster response and in disaster preparedness measures, neither as recipients of aid to meet their basic as well as specific needs, nor as active stakeholders and designers or planners of aid measures, voicing their own needs and opinions. Inclusive reconstruction and development, focussing on participation and empowerment of all groups of society and especially of vulnerable groups, leads to better living conditions than before the disaster and at the same time to a higher level of preparedness and thus reduction of vulnerability in the face of a potential next disaster. Continue reading Disasters are Always Inclusive. OK, this site could be a big development for sharing travel information in the disability community. Now is the time to determine that for yourself. If you like it share it with your friends. Where you see it needs improvement share that directly with TripWolf. Or, as soon as you register, add me as a Friend. I'm on the site as Rolling Rains. This will allow us to compare evaluations of the site's usefulness. It will also allow us to better inform the site's staff on the needs of people with disabilities. New York City, July 1, 2008. Today tripwolf.com (http://www.tripwolf.com) is released publicly to the US market. tripwolf is a new social travel guide that covers the whole world, focusing mainly on Europe. tripwolf combines professional editorial content with user-generated content from globetrotters worldwide. interest - online for free. Continue reading TripWolf is Live With 200,000+ Destinations and all MairDumont's Content. Dr Ajith C S Perera has worked tirelessly to promote Inclusive Destination Development in Sri Lanka through his organization IDIRAYA. Below is an article from Lanka Business Online noting his new sponsor CEAT Tyres. Continue reading Sri Lanka: IDIRAYA and CEAT Tyres Team up for Inclusion. ADAWatch.org of the National Coalition for Disability Rights offers the following article on current US disability legislation. It reports on the fundamentally flawed legislation known as the ADA Amendments Act which accepts a scarcity model of social resources rather than affirmation of Universal Design and implicitly endorses the Medical Model of Disability by accepting a medically determined severity test. Continue reading The ADA Amendments Act is Not the ADA Restoration Act.